It’s 13″ x 17-1/2″ x9″ — or about the size of a standard backpack — but I’d imagine it’s going to weight quite a bit when packed full of tools. Along those lines, I’m a little concerned about durability. I’d love to see the stitching around where the straps connect to the bag. And speaking of straps — they don’t really look like they have enough padding to keep from digging in under the weight. Do any of you have experience with one of these, or with carrying tools in this way? Street pricing starts at around $60, though many vendors want $80+ for it. )We found it for $60 from Amazon.) If you go looking for one, shop hard! It’s not exactly organized on the inside, however. The pockets are sized for PC cards and CDs, and lots of papers. Most of my tools ride in the generic “accessories” velcro-flap pouch, and I just dig through when I need something. The paper-organizer parts do an admirable job of keeping coiled cables from tangling, so that’s cool. 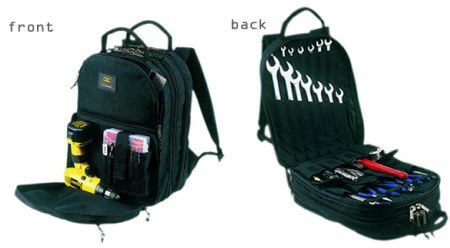 Just looking at the backpack in this post, I think it wouldn’t necessarily fit my tools any better. I don’t travel with a full set of combination wrenches, and I’m hard-pressed to see how those pockets would be useful for much else. The strap for securing the power drill is pretty slick, though.